This is guest post #3 from my friend Amanda from The Homemade Cook. See post #1 here. See post #2 here. Doesn’t this photo from Amanda make you want to be her neighbor, so she’ll share nachos with you. And make you want to lick your screen. And make you want to buy an Instant Pot right now. 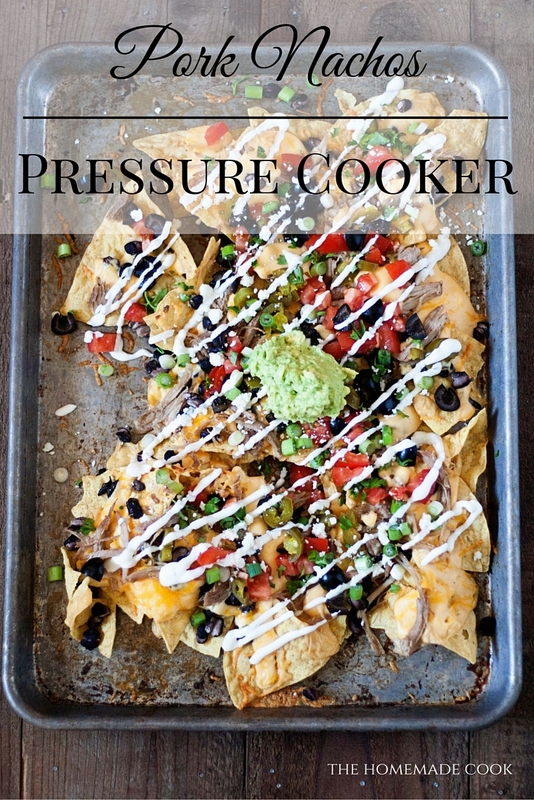 These pork nachos are made using the all-purpose pressure cooker shredded pork we shared last week. And check out the cheese sauce that Amanda makes for these nachos…genius! Toppings: pinto, refried or black beans, pico de gallo, avocado or guacamole, black olives, sour cream, cilantro, cotija cheese or picked jalapenos. Stir until the cheese melts and the mixture begins to thicken. Remove from heat and add as much evaporated milk as you need to make it the consistency you want. Layer the chips filling a baking sheet. Add pork on top of chips. Sprinkle the pork with the cheese sauce, a little more shredded cheese, and pinto, refried, or black beans (if using). Bake in the preheated oven for 5 to 7 minutes, or until the chips start to toast and the shredded cheese melts. Top with your favorite toppings and serve Shredded Pork Nachos.